Australian singer-songwriter and Atlantic recording artist Vance Joy has announced the release of a brand new single, following his recent MTV Video Music Award nomination for the highly anticipated "Artist To Watch" category. The new song titled "Fire and the Flood" is the first taste of fresh material and will be included on a special edition of his breakthrough 2014 debut album, Dream Your Life Away, available for streaming and at all DSPs beginning July 24. "I had a recurring image in my head of a guy walking in the neighbourhood where his ex-girlfriend lives," Vance Joy says about his inspiration for "Fire and the Flood." "He is haunting the places they used to go together. He has time on his hands and feels kind of useless. He thinks that when they are back together he'll be at peace again." "Fire and the Flood" made its world debut earlier this week via Australia's triple j. The track's striking companion video -- directed by Hayley Young (AWOLNATION, The Apache Relay) -- can be viewed now at Vance Joy's official YouTube channel, www.youtube.com/user/vancejoymusic. On working with Young, Vance Joy explains, "I am an admirer of Hayley's work and I liked her idea of doing a long take and having me sing directly to camera. I just sang it really loud and with as much conviction as I could muster, in the hope that the point would get across. She'd yell out from behind the camera if she was into what I was doing, which gave me confidence. It was the first time I've really given that kind of performance to a video clip." 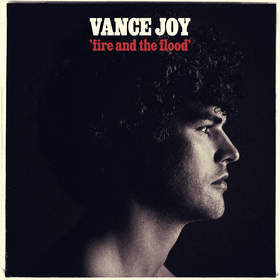 The release of "Fire and the Flood" follows Vance Joy's nomination announced earlier this week for the highly anticipated "Artist To Watch" category at the 2015 MTV Video Music Awards. The nomination recognizes Vance Joy's global breakthrough smash "Riptide," which is 2x platinum in America, and is certified gold or platinum in most major markets around the world. The "Riptide" companion video is now nearing 80 million individual views at http://youtu.be/uJ_1HMAGb4k. Vance Joy -- a.k.a. James Keogh -- is currently supporting Taylor Swift on her 1989 World Tour. The summer will also see a number of headline shows and North American festival appearances (tour itinerary below). For complete details and ticket information, please visit www.vancejoy.com. Dream Your Life Away made an immediate impact around the world upon its 2014 release, where it debuted top 20 globally. The album is highlighted of course by the global breakthrough smash "Riptide," which has been streamed on Spotify alone over 225 million time globally. "Mess is Mine," the second hit single from Dream Your Life Away, proved another multi-format success. The track reached the top 5 at Alternative outlets nationwide with Spotify streams over 46 million and its companion video drawing nearly 6 million views thus far at https://youtu.be/1C816p-KTNk. For more, please see http://vancejoy.com, www.facebook.com/Vancejoy, http://twitter.com/vancejoy, and www.atlanticrecords.com. * w Taylor Swift's "The 1989 World Tour"